Here's our guide on how you can go about tracking down and killing the Lunastra in Monster Hunter World. 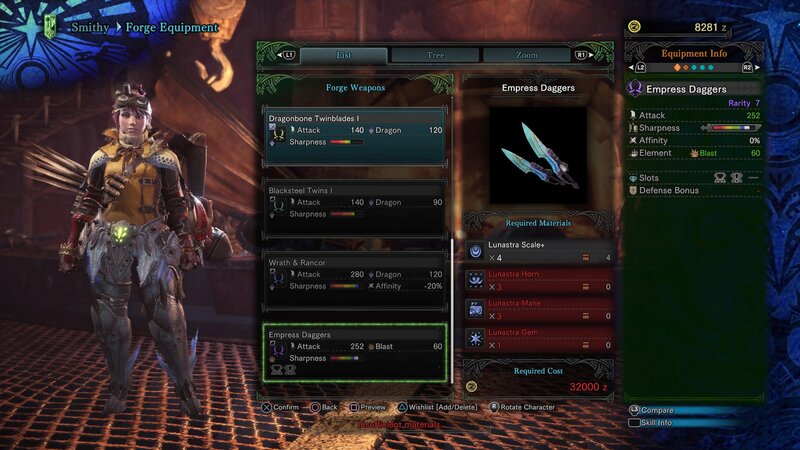 The Lunastra was added to Monster Hunter World a good few months after launch, and basically acts as the other half of the Teostra. In this Monster Monster Hunter World Lunastra guide, we'll be providing you with all the information you need to take down the creature in combat, including the gear you should bring with you for the fight ahead. 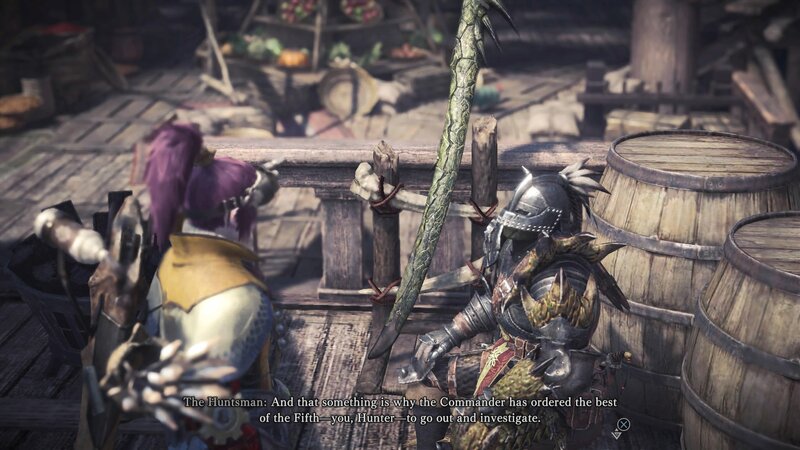 If you instead need help with anything else relating to Capcom’s smash hit game, you’ll want to head over to our Monster Hunter World guides hub. It’s here that you can find our complete beginner’s guide to the game, as well as all the information you need to properly get to grips with the fourteen different weapon types in the game. 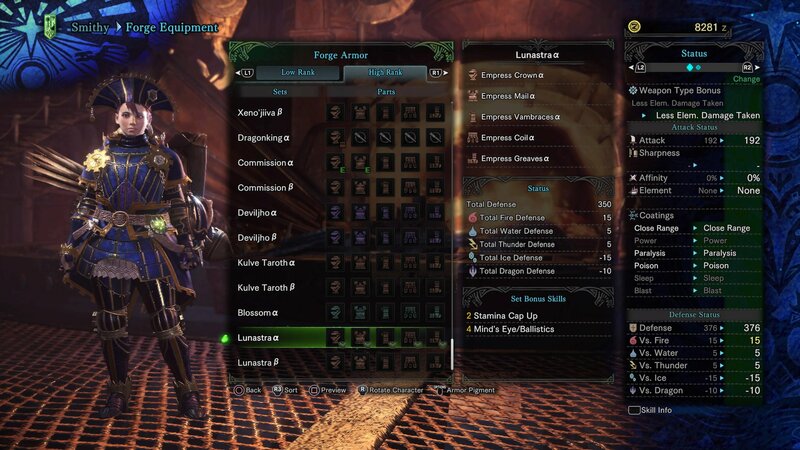 The free Lunastra update for all MHW players is part of Capcom’s big event schedule for the game, to keep it fresh over the coming months. 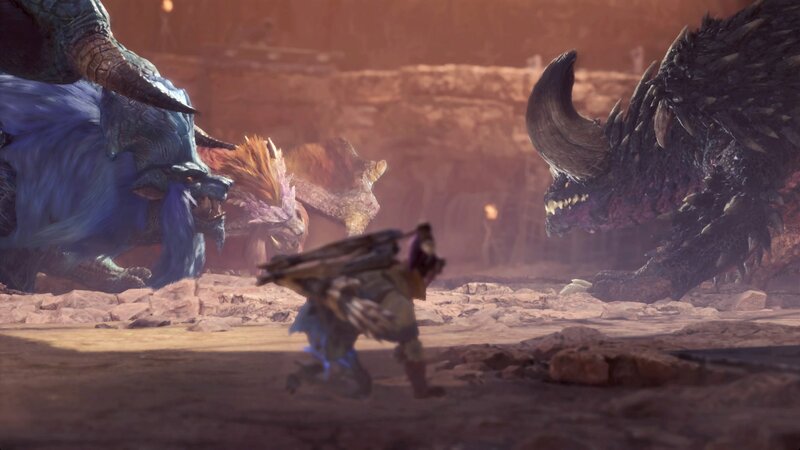 For a complete list of future events and DLC just like this one, head over to our Monster Hunter World events schedule guide. As we mentioned at the top, the free Lunastra update is now live for all Monster Hunter World to download. It comes in at merely 500 MBs on PS4 and Xbox One, to don't worry about the new download taking a long time to complete. The highlight of the brand new update is obviously the titular Elder Dragon Lunastra. 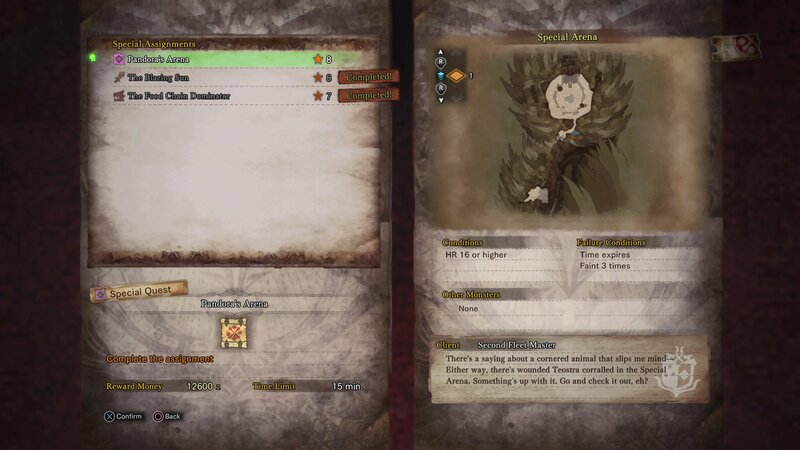 This marks the third monster that Capcom has added to MHW after it launched back in January 2018, with the Deviljho, and then the Elder Dragon Kulve Taroth both being added to the game over the past few months. But in order to find the Lunastra in Monster Hunter World, you'll have to jump through a few hoops first. Firstly, go to the Huntsman in the Astera Trading Yard, and he'll assign you the 'Blazing Sun' quest, which sees you taking down a Teostra in the Wildspire Waste. After you've completed The Blazing Sun, return to the Huntsman once again. This time, he'll direct you to the Smithy in the Workshop area of Astera. Talk to the Smithy, and he'll assign you the 'Pandora's Arena' quest, saying that a wounded Teostra has crash landed in the Special Arena. Remember this is an Elder Dragon, so traps won't work on the Lunastra. Lunastra deals fire damage like Teostra, so make sure to bring some fire-proof armor. The Cool Drink item is essential for surviving this fight. This Elder Dragon specializes in shooting pillars of blue fire across the battlefield in cones, and incredibly quickly too. You'll continually take heavy damage for all the time you're caught in the blue fire. 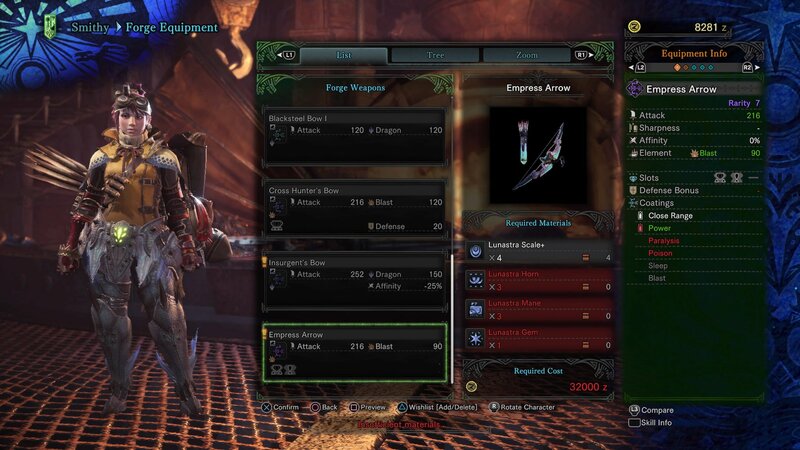 A Bow is a great choice for taking on the Lunastra, but any blue fire left on the battlefield will stop your arrows in their tracks. 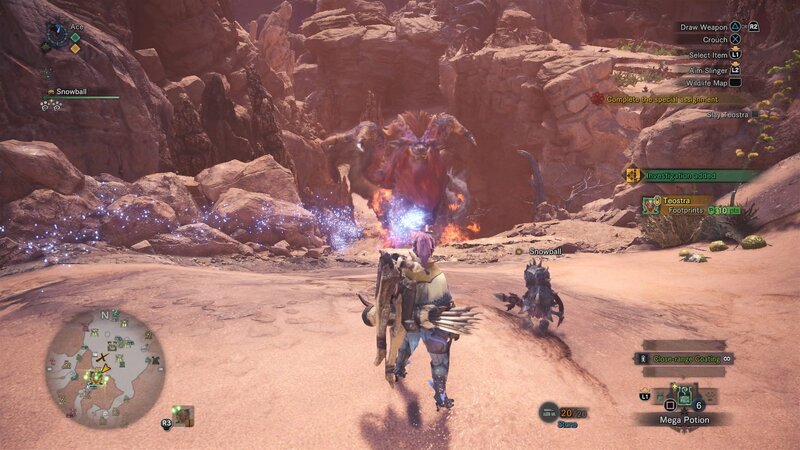 The head, tail, and wings of the Lunastra are its weak points. You're in the Special Arena for this fight, so make sure to use the boulder trap and the Dragonator when possible. 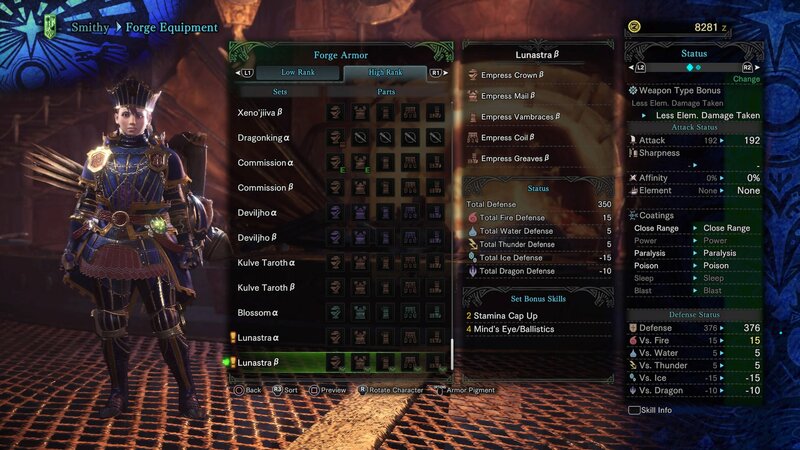 Just below, you can see the entirely new set of Lunastra armor that will be available for you to craft once you've slain the new Elder Dragon. 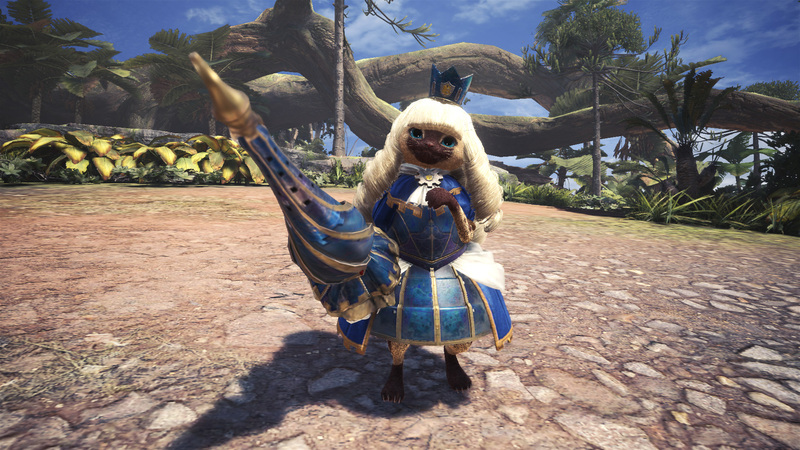 There's also new weapons that can be crafted from the Lunastra, as well as a completely new Lunastra outfit for your Palico that you can bestow upon your feline friend. This is the conclusion of our Monster Hunter World guide for the new Lunastra Elder Dragon, but our guides for the overall game don’t end here. Head over to our Monster Hunter World Sinister Cloth farming guide, or our Jewel farming guide for how to obtain either type of item at a rapid pace.